How is a 15-foot fiberglass giraffe like good community organizing? Picture this: ten young West Virginians carrying a 350-lb fiberglass giraffe through the grounds of a community center in a low-income neighborhood in the Chemical Valley. It’s a bizarre sight – and it certainly isn’t what the socially-conscious participants expected when they signed up for a summer with Build-It-Up! West Virginia, to build infrastructure and expand the capacity of long-term community-run sustainable economic projects in the coalfields. But Build-It-Up! exists for a bigger reason: to work in solidarity with communities. For centuries, missionaries, extractive industries, volunteers and other outsiders have come to West Virginia to “fix” the state, without ever asking what – if anything – needs fixed. Build-It-Up! makes the extra effort to work with community members, listen to people’s stories, and otherwise assess the needs. As we build infrastructure, we build trust as well. The community center got its feet off the ground this year with monthly open-mic nights that also serve as a forum for community members. Suggestions from neighbors resulted in a huge, community-painted mural now prominent inside the old arcade, and now, with help from Build-It-Up! 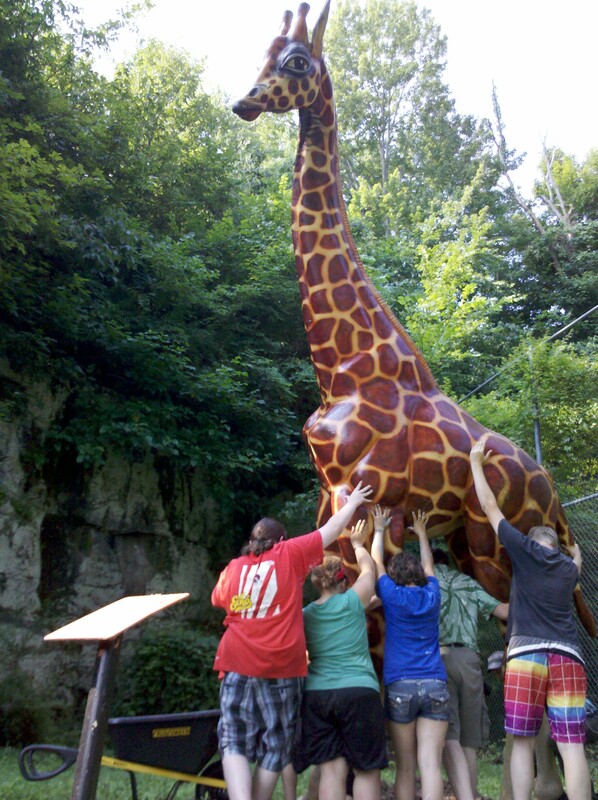 West Virginia, the minigolf course is being restored to its former glory, giraffe and all. Participants will go door-to-door in the community to spread word of the progress at the center. Over the next three weeks, volunteer engineers will transform ideas for minigolf obstacles collected from local teenagers into plans for Build-It-Up! to construct in our second week at the site. That’s what good community organizing looks like – identifying real needs in a community that they can’t implement on their own, connecting the community to the needed resources, working in solidarity with them, and helping them build capacity. And sometimes, it may just look like a fiberglass giraffe. Right on. Such a cool take on Summer of Solutions. Minigolf makes me smile. Way to go, Build-It-Up! team!